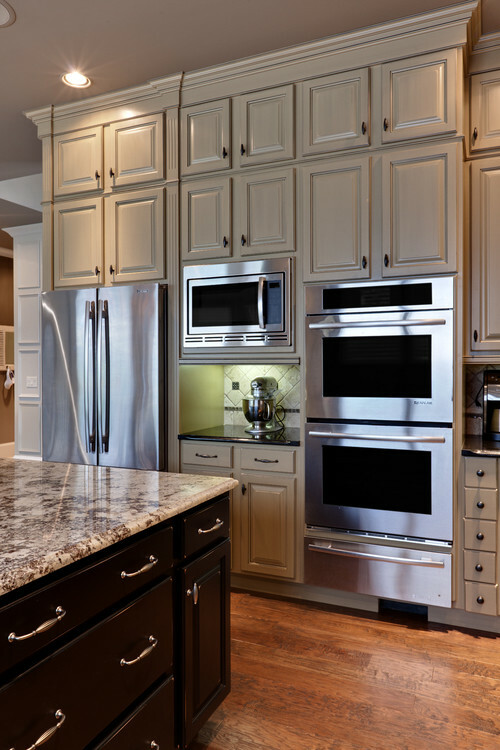 When you consider a luxury appliance brand, names such as Miele, Wolf, and Thermador, Jenn-Air and Viking are some of the first you will consider. This article is about two different companies with two very different approaches to their products. We will look at the special features, brands, the products, and compare at the end. Today we’re going to focus on something a bit different. 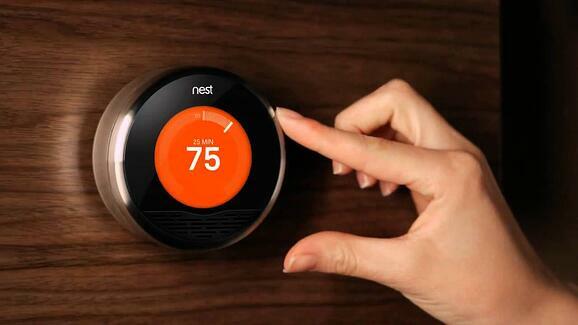 Nest is a smart, learning home thermostat. Nest Labs is a start up founded in 2010 by two former Apple engineers Tony Fadell and Matt Rogers. The home automation system known for its thermostats, smoke detectors, and security systems is a self learning, sensor driven Wi-Fi base system. In 2014 they were acquired by Google. What’s so cool about Nest is the ability to control your thermostat and adapts to your daily life by knowing when you prefer the heat up or air conditioner on. Like the thermostat, the nest Smoke & CO2 alarm and camera can all be monitored and control via a smart phone when you are away from home. What’s exciting is the new Jenn-Air wall oven will have the Nest built-in capabilities. With Nest enhancement you can manually set temperatures and cooking modes without hassle on the Culinary Center app. The Nest Thermostat can detect if your oven is on and lower the room temperature or even send you an alert that you’ve forgot to turn off your oven before leaving your house. Nest will be arriving Summer 2016 and they will also be backward compatible to the most current Jenn-Air wall ovens with a software update. On a different spectrum, what is a French door wall oven? It’s very common to see them in commercial applications, but rare for private home use. French door wall ovens have two doors opening simultaneously when you pull on one handle. The huge advantage to French door wall ovens is safety and not having to bend over trying to reach in the oven. Let's look at the companies. Viking was founded in 1987 by Fred Carl of Greenwood, Mississippi and was family owned and operated until being acquired by Middleby Corporation of Elgin, IL. Middleby has had legacy issues and recalls from the former regime. Their French door wall oven is one of the first new products. We think they should straighten out their older products first. To be transparent, we no longer sell Viking products. Jenn-Air was founded by Louis Jenn in Indianapolis, IN in 1947 then later becoming Jenn-Air corp. They are known for the downdraft and the first American convection oven. In 2004, they were purchased by Whirlpool Corp who has spent 30 million improving the Jenn-Air offerings. These wall ovens along with pro ranges are among their first. Viking offers a commercial look and cooking experience comes in all stainless steel or six different colors to choose from. Regardless which finish you choose Viking boost a large 4.7 cu. ft. oven capacity in its classic look. It’s loaded with 11 high cooking modes and is very versatile to meet every baking command. What’s very unique is their patented Vari-Speed dual flow convection system with the largest fan in the industry. The 8 ½” two speed fan works bi-directional to maximize airflow for excellent results. Jenn-Air on the other hand offers a modern appeal and functionality. The oven has a 7” full color touch screen display. A full-color LCD display allows the user to touch anywhere on the display to select options that are organized precisely on each screen. The display intuitively presents information to make it easy. All you have to do is enter the food, weight and doneness. The oven does the rest. Jenn-Air is twin convection versus Viking's single convection fan. Jenn-Air’s current model JJW3830DS software will be fully upgradable to the summer release of Jenn-Air new nest capabilities. Sending commands to your oven couldn’t be any easier anywhere else around your home with the aid of your smart phone. So what do you think? Do you like the safety advantage of the Viking French door or the technology of the Jenn-Air with Nest and their Culinary Center? In terms of reliability, Jenn-Air is a bit better than average while Viking still needs to work on their quality control. Need more information on wall ovens? 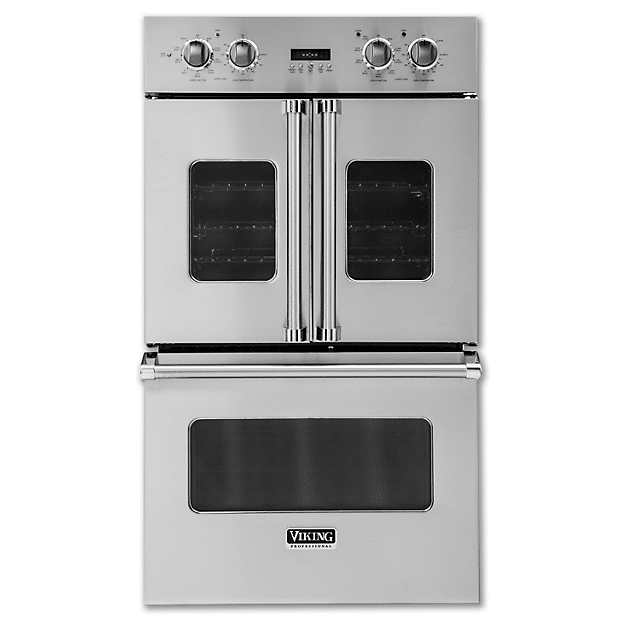 Get the Yale Wall Oven Buying Guide. We cover the newest technologies and best brands like Wolf, Miele, Viking, KitchenAid, Jenn-Air and more. Well over 165,000 people have read a Yale Guide.